Kirksville, Mo., a rural city in Benton Township with a population of 17,536, serves as the county seat of Adair County. For years it had contracted out for the laying of asphalt, including for repairs. 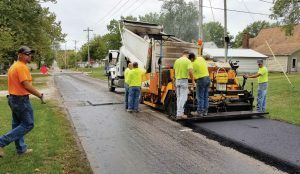 One day in 2016, Ray Sandstrom, street superintendent of Kirksville, approached his boss, public works Director Glenn Balliew, with an incredulous proposal: Why doesn’t the city buy its own asphalt mixing plant instead of shelling out significantly more money that could be used for other more pressing endeavors? Wouldn’t the savings be substantial? Balliew, true to form, put on his Missouri state “Show-Me” demeanor but allowed Sandstrom to form a task force to explore the idea. Meanwhile, an old asphalt batch plant was already located in Kirksville but seldom operated — why? This sparked an idea, however. Since it was already in existence, why not develop it into service? As to why, Kirksville took on this enterprise, Balliew noted the city’s street infrastructure was failing at an alarming rate. The city had an outside company perform a complete study of every street in the community to include budget recommendations. The study indicated that the overall street pavement condition index was 57 and streets were severely underfunded. “Funding for streets is tough because streets are nonrevenue generating,” said Balliew. “The city street budget had not seen a significant increase for almost 30 years until the citizens voted to permanently extend an economic development sales tax that added $600,000 to the street budget beginning in 2019. Adding a street construction crew to the staff and buying an asphalt plant was a bold move. The plan is to find efficiencies that would allow the city to do more with the funding provided by the taxpayers. The city can rehabilitate neighborhoods and repair drainage at a huge reduction in cost, and contractors can rehabilitate major streets that require more manpower. 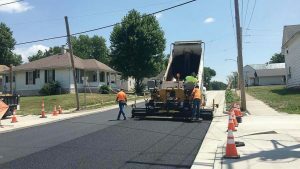 In 2019, the city expects to rehabilitate more than 7 miles of streets; this is the most that has been rehabilitated in a single season in more than 20 years. Also, partnering with the civil and environmental engineering department of the University of Missouri, 92 miles away in Columbia, was a game changer. The university’s Missouri Asphalt Pavement and Innovation Lab experimented with finding the best possible asphalt mix for Kirksville’s plant. Asked if there was any opposition to creating the new plant, Balliew stated that this was a difficult fight because the city was losing more streets annually than they were repairing. “Something had to change,” admitted Balliew. Regional and local contractors voiced opposition to the idea, which they didn’t like at all. They didn’t realize that through the in-house construction and creation of the asphalt plant they would be getting as much, if not more, work as they had in the past. This was a result of the city’s goal to repair even more streets. Other purchases included the asphalt drum mixers unit, which produces up to 110 tons an hour of two kinds of asphalt paving material; a slipform curb machine; GPS surveying equipment for the street division; a small LeeBoy asphalt paver; and a tractor-trailer truck to haul limestone from a quarry. A Wirtgen asphalt milling machine is sporadically leased for the preparation of streets for new pavement. Balliew and his crew could not locate another city of Kirksville’s size from which to model their asphalt plant off. As far as reactions to the plant, Balliew noted there were citizens and city leader both for and against it. Mari Macomber, Kirksville city manager, is happy about the endeavor for two reasons. Sandstrom wouldn’t do anything differently if he had to do the project over.